After ten months of negotiations, CWA members have not been able to reach agreement on a fair contract with Frontier Communications. As a result, 1,400 Frontier Communications workers in West Virginia and in Ashburn, Va., went on strike at 12:01 am on Sunday, March 4. WV State Police arrested a temporary Frontier worker who pulled a gun on a striker in Flatwoods, W.Va.
"We're taking a stand," said Johnny Bailey, President of CWA Local 2276 in Bluefield, W.Va. "Customers are waiting way too long to have their problems resolved, and too often we're back fixing the same problems over and over again. Frontier is leaving West Virginia behind. The network has been neglected and there are just not enough experienced, well-trained workers left to handle the service requests." An analysis of informal complaints filed with the West Virginia Public Service Commission shows that complaints have increased steadily over the past three years, rising 69% from 639 complaints in 2014 to 1,072 complaints in 2017. Since Frontier acquired Verizon's landlines in West Virginia in 2010, the company has cut more than 500 good, middle-class jobs in the state. Ed Mooney, Vice President of CWA District 2-13, urged Frontier customers to exercise caution after the WV State Police arrested an armed temporary Frontier worker who threatened a striker in Flatwoods, W.Va., on Tuesday. Frontier workers in West Virginia and Ashburn, Va., are on strike to protect good middle-class jobs and their communities. The Register Herald, The Record Delta, WVNS TV, WDTV, The Journal, TimesWV.com, WHSV, WV News, Williamson Daily News. Negotiations between CWA District 4 and AT&T Midwest kicked off Tuesday. CWA District 4 Vice President Linda L. Hinton told AT&T that members' priorities for a new agreement include job security, healthcare, and retirement. She noted that AT&T CEO Randall Stephenson was one of the biggest supporters of the corporate tax cut bill and promised to create thousands of high wage jobs if it passed. "The Company's profits and tax windfalls must turn into jobs and employment security for CWA members," Hinton said. "It is time for AT&T to live up to Stephenson’s promises. Stop the layoffs. Show us the jobs. Show us the good, high-wage jobs Stephenson promised." Read the AT&T Midwest District 4 bargaining report here. Members of CWA Local 4621 in Appleton, Wis., are ready for fight for a fair contract at AT&T Midwest. Negotiations between CWA Legacy T and AT&T kicked off Tuesday. Vice President of Telecommunications & Technologies Lisa Bolton said, "In this round of bargaining, the Union will demand an end to contracting out while laying off workers. We want to stop AT&T from farming out our work to the lowest bidder. We want to call a halt to AT&T sending more work to contractors than to bargaining unit members. After the tax bill passed, Stephenson promised the company would create 7,000 good, skilled, high-wage jobs that pay $70,000 to $80,000 a year. But at our bargaining tables, management demands second tier jobs with second tier wages and second tier benefits. It is time for AT&T to live up to Stephenson's promises." Read the Legacy T bargaining reports here. It's bad enough that big bank CEOs and large shareholders are getting billions of dollars from the Republican corporate tax cut. Now, a new report from CWA and the Committee for Better Banks shows that those same banks have been aggressively laying off American workers and offshoring jobs – especially in the call center and customer service industry – to low-wage countries. Even worse, the tax bill contains incentives that will encourage even more offshoring. 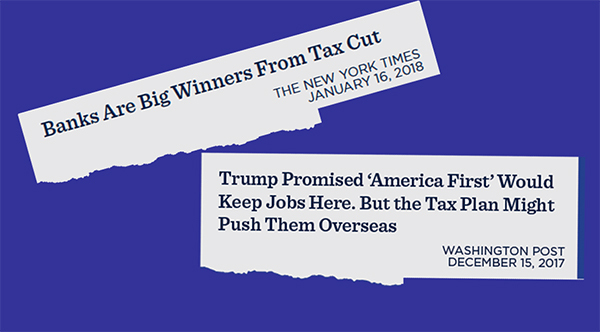 "We are releasing this report to start a conversation with the public, in Congress, and in the political arena about how the big Wall Street banks like Wells Fargo are pocketing the money from the tax scam while destroying thousands and thousands of American jobs and potentially jeopardizing individuals' personal data by shipping these jobs overseas," said CWA President Chris Shelton. Michael Lewis, a former worker at an American Express call center in Phoenix, Ariz., and Pam Wynn, a former Bank of America call center worker in Cleveland, Ohio, joined President Shelton and Ohio Senator Sherrod Brown on a press call to discuss what happened when their jobs were sent overseas. American Express sent Lewis to India where he was forced to train his replacement. "When I returned from India, several whole floors of the center were called in, team by team, and fired," Lewis reported. It's clear that banks and other employers will continue to send jobs overseas unless we take action. That's why CWA members are fighting for federal and state call center bills. The federal call center legislation, co-sponsored by Senator Brown in the Senate, would add new accountability and transparency to the offshoring process and make U.S. companies that offshore their call center jobs ineligible for certain taxpayer funded grants and loans. In addition, the bill would give U.S. consumers a right to know where they are calling and to be transferred to a U.S.-based location. "We need to change how we think about work and how we think about our economy in this country," said Senator Brown. "So many companies wouldn't be able to function without a good, strong customer service staff. Workers like Ms. Wynn and Mr. Lewis contribute to their businesses and bring ideas to work to make it better. We need to value their contributions – not end their careers and ship their jobs overseas. Thanks for speaking out, and thanks to CWA for making such a difference in so many people's lives. What you do really matters." Listen to the press call. Read the new CWA/CBB report on bank offshoring. Ask your members of Congress to support the call center bill. This Tuesday, CWA's working class agenda gained ground in both Democratic and Republican primaries in Texas. 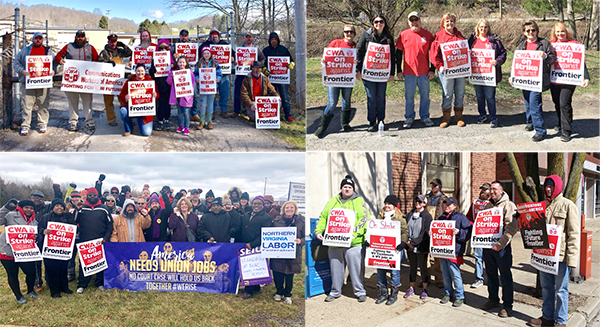 Across the state, CWA members participated in block walks, phone banks, and put up signs to help elect candidates in both parties who committed to working with labor on working class issues in the next legislative session. Highlights from Tuesday include primary victories for candidates who will likely become the first two Latina representatives from Texas in Congress as they are running in heavily Democratic districts: Veronica Escobar from El Paso, who is running in the 17th district, and Sylvia Garcia from Houston, who is running in the 29th district. In addition, Democratic Senate candidate Beto O'Rourke won his primary and will now run against Senator Ted Cruz in the general election. CWA members in Texas continue to lead the way across the state by coordinating labor get-out-the-vote rallies, canvasses, and phone banks. 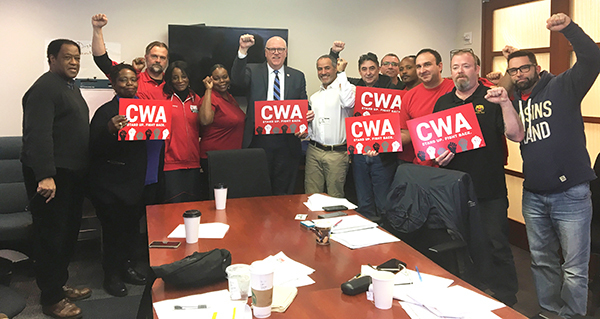 Rep. Yvette Clarke (N.Y.-9) and Rep. Joe Crowley (N.Y.-14) met with CWA members to discuss a number of different issues including workers' rights, outsourcing of call center jobs, voting rights, and the effects of the recent GOP tax bill. Both candidates, endorsed by CWA in the 2018 elections, spoke strongly about their commitment to work on behalf of unions in the wake of the impending Janus v AFSCME Supreme Court decision, as well as the need to protect U.S. jobs. "With increasing attacks on unions and legislators voting to line the pockets of the country's richest instead of working for a stronger middle class, the 2018 Midterm elections are going to be critically important," said District 1 President Dennis Trainor. "We need leaders in this country who will fight for working people, like Reps. Clarke and Crowley. We know we can count on them to keep up their long track records of fighting to strengthen our unions." NYC Legislative Political Action Committee members with Rep. Joe Crowley (center). In a big victory for New York consumers, CWA reached a settlement with Verizon that will require the company to repair 54 central offices across the state, replace bad cable, defective equipment, faulty back-up batteries, and to take down 64,000 double telephone poles. The agreement also includes increased broadband buildout to major apartment buildings in New York City and more than 30,000 homes across the state. The settlement is the result of a CWA campaign to pressure the New York Public Service Commission (PSC) to require Verizon to upgrade and repair the legacy telephone network and to expand consumer access to broadband. CWA reached a similar settlement in Pennsylvania last year. That settlement required the company to repair and replace bad cable, defective equipment, faulty back-up batteries, and to take down 15,000 double telephone poles. 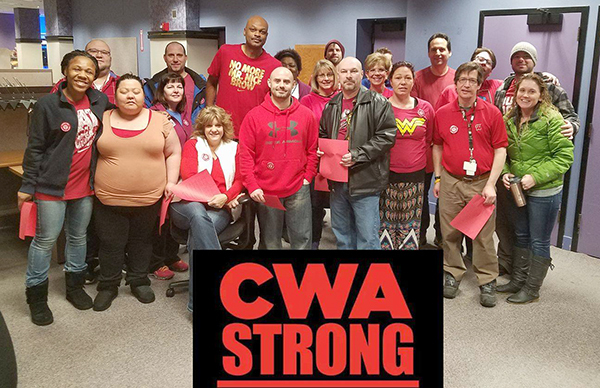 CWA members from Locals 1133, 1126, 1122, 1168, 1111, and IUE-CWA Local 81381 participated in a CWA "Fight Forward" training in Rochester, N.Y., to learn how to build power through local activism and mobilization. The training is designed to give CWAers tools to stem the dangerous assaults on the working class and to move forward toward a more just and equitable society. 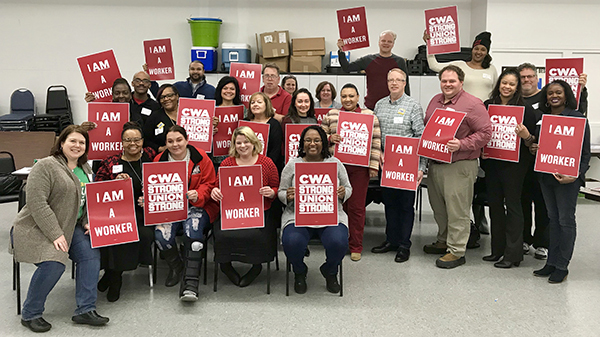 CWA members participated in a Fight Forward training in Rochester, N.Y., to learn how to build power through local activism and mobilization. 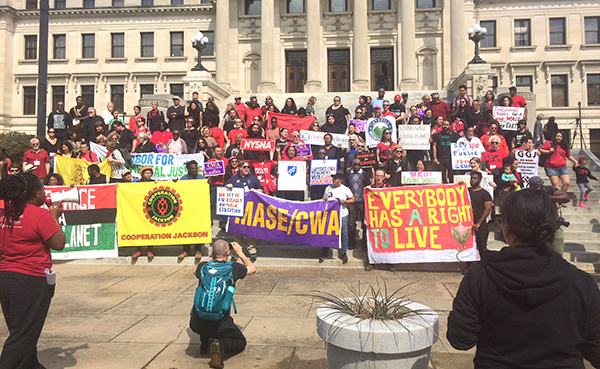 CWA members from Jackson, Miss., and the surrounding area rallied on the Capitol steps last week to demand a livable wage for Jackson municipal workers. They were joined by partners and allies attending the Just Transition Forum, an event bringing together members of the labor community and environmental justice groups from across the country to share strategies and collaborate with each other on labor and environmental initiatives. The CWAers and allies were greeted by state legislators and supporters from the community on the Capitol steps. I am a member of my union's Diversity and Inclusion Committee and through my committee I decided to take action to make sure my fellow AT&T Mobility members had the opportunity to be tested for breast cancer. Because early detection is key, I worked with my union and got permission from management to bring in a mobile clinic to screen members for breast cancer. As a result, on March 21, 2018 we will have the Mammogram Mobile Services visit our call center to screen our brothers and sisters on-site for breast cancer. Health care is so important to us all and is a great benefit that our union has fought for us to have. This is a benefit that should be given to every human being and not just the wealthy. Remember to take advantage of your union healthcare because it truly can save your life.